Have you ever wondered why your pancakes sometimes have ugly craters, or a weird ring around their edges? A new analysis of pancake recipes could help you exploit physics to make the perfect pancake — and possibly one day save your sight. To understand pancake analysis, we have to understand a couple of terms. The first is “aspect ratio,” which compares the diameter of a pancake (to the third power) and the volume of the batter it took to make the pancake. The lower the aspect ratio, the thicker the pancake—because an equal volume of batter will make a smaller and smaller pancake. The second term is “baker’s percentage,” which is the ratio of liquid to flour. The higher the baker’s percentage, the thinner the batter. Lowering the baker’s percentage means a smaller amount of flour added to an unvarying amount of liquid. In this latest study, the aspect ratio of different pancakes varied dramatically, depending on the recipe. 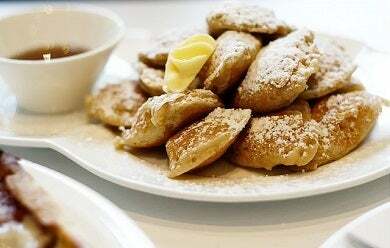 Thick Dutch poffertjes, which look like coin-sized pillows, had an aspect ratio of 3, while parchment-thin crêpes had an aspect ratio of 300. The baker’s percentage didn’t vary nearly as much—it stayed between 100 and 225 for all the pancakes tested, but it produced some very interesting differences in browning. Now let’s talk about how percentage works. Make a thick batter, with a baker’s percentage of 100, and you’ll get weird craters. Cooking evaporates the water in the pancake batter, but that water has to go somewhere. Thick pancakes trap it. As it tries to push upwards and escape, it makes craters. Whip up a thin batter with a baker’s percentage of 225, and you’ll get a lot of little dark spots, a dark ring around the edge of the pancake where the batter is thinnest, and a lot of little holes in the top. The batter is thin enough for the water to escape through the cooking pancake, leaving the dough to darken if not burn. An intermediate pancake with a baker’s percentage of 175, or a very small pancake, regardless of batter thickness, will brown evenly as the water escapes smoothly. So what does this have to do with saving your eyes? Glaucoma is the result of liquid building up in the eye and being unable to escape. This puts pressure on the optic nerve, slowly damaging it and causing blindness. Figuring out how liquid can escape, either through or around a thin surface, is a good way to save people’s sight. Sound far-fetched? Let these two scientists make wonderful pancakes and explain the correlation with equally wonderful accents.